There is currently only one model of new NordicTrack cross-country ski machine being manufactured, the Classic NordicTrack “PRO” Skier. There were many other models produced in the past, all featuring NordicTrack’s patented flywheel & one-way clutch mechanism, adjustable upper and lower body resistance, and the ability to fold for storage. All models feature the same full-body motion that mimics cross-country skiing. Each model provides a great aerobic workout, but the machines will be more comfortable and easier to customize as you move up the product line. Love the comparison chart, informative to know what the difference is between the models. Looks like the one they still manufacture has the best options overall. I like that it can fold up, I have a small house so all my equipment need to be moveable. I used in a health club before but haven’t used one in the home. Thank you for the review on the nordic track exercise machine. 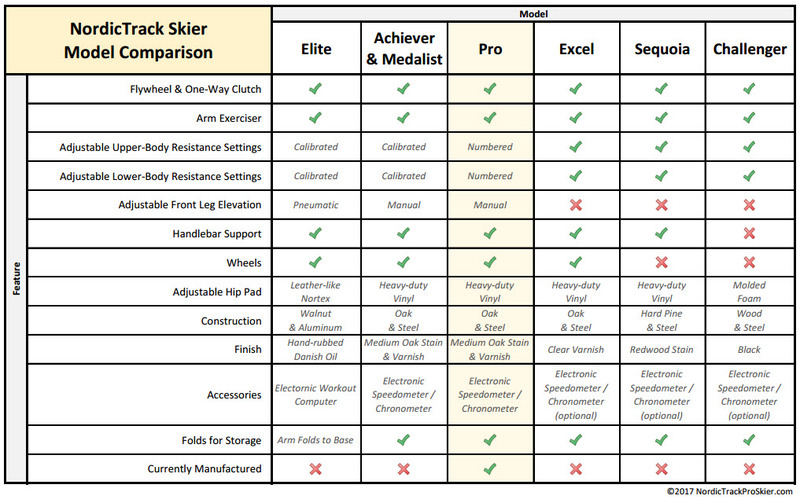 Hi Jen, Thank you for reading up on the different skier models on NordicTrackProSkier.com! There is one model currently manufactured, the Pro, which has been the company’s best seller for years. Also exciting is that the selling price for new machines has come down a bit in 20 years: the Pro Skier used to cost $600 and there were NEVER any sales / discounts. Today the MSRP is $999, but the sale price is only $549! I’m very happy to hear that you found this information on the Nordic Track Pro Skier to be beneficial. Great information! Thank you for this article! I’ve been looking at buying a used model to see if I like it. The information you have provided will help me to find the right machine for me! I have an Achiver model NordicTrack Skier machine made in 1992. I have put in to use periodically over the years and had no troubles with it. It is now giving me trouble with the tentioner for the skies ,in that with the tention turned all the way to the lightest the machine runs at max poundage .The machine is still usable but definitely not fun to use in it’s current state. I purchased this machine at a yard sale many years ago without an owners manual. Is there anything I can do to make the tentioner adjustable again? I have an older nordictrack pro skier(1992?) with a blue botton monitor and pulse functions. I desperately need a owners manual/instructions for skier and workout computer. I contacted Nordictrack and was told I need the model number which is 5-6 digits beginning with a 2 or 6 digits beginning with “NT”. Can’t locate this on skier. Help?